Single-handedly architected and proved a revolutionary algorithm for registered independent advisors (RIA’s) on normalizing and consolidating investment portfolio financials, harvested from over 10,000 financial data sources, into meaningful, comprehensive, and accurate data for generating performance reports in portfolio accounting applications - reducing data entry by 90%. Prepared a U.S. patent for this solution. The global patent searches identified no existing patents for this algorithm, however E*TRADE, a $48 B firm, submitted a nearly identical patent during the blind spot of the patent search. Facilitated Sarbanes Oxley Compliance within 90 days for Extended Systems, a mobile database software company, by implementing a new custom sales system; migrating data from their prior sales system; developing interfaces to synchronize data between their sales and financial systems; and launching an international solution throughout offices within the United States, Germany, France, and the United Kingdom. Impact: Almost immediately after having obtained SOX compliance, and close to the deadline of being delisted from the NASDAQ stock exchange, Sybase announced its acquisition of the company for $71.3 M.
Architected the first real-time vehicle visualization and monitoring system providing real-time access to vehicle and vehicle fleet health, location, and probability of failure using raw vehicle, from ECC (electronic control unit), and GPS data sent via satellite modems. 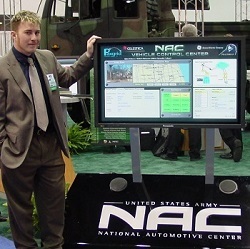 United States Army Three-Star and Four-Star Generals at the SAE show in Detroit 2004 as a means for commanders to monitor the health and location of vehicles under their command in real time. Allstate Insurance as a means to offer insurance policies and rates to drivers based on their individual driving behavior, an alternative to insurance policies driven by statistical data. Environment Canada in Toronto as a means to remotely monitor vehicle emissions. General Electric, the largest vehicle fleet lessor in the United States at the time, as a means to monitor the health of leased vehicles -- enabling them to identify and remedy problems before they escalate into serious and costly repairs. Developed one of the first multi-channel marketing applications for Infini Solutions, a direct marketing firm, to calculate estimated delivery dates for each individual item in multi-million-piece mailings, sent through the US Postal Service. Impact: This solution gave them an additional service to offer their clients and a significant market advantage. With accurate estimated delivery dates for individual items in multi-million-piece mailings, usually product catalogs, each recipient could be sent an email the day before receiving the catalog -- informing them of its arrival, and called the day after they've received it -- asking if they had any questions or if they'd like to place an order. Designed, developed, and launched the first social networking website dedicated to reestablishing relationships between former co-workers of Arthur Andersen, LLP. This enabled over 10,000 former employees, from over 75 countries to maintain relationships with their former co-workers. Impact: This website was launched 2 years before Facebook, 1 year before Myspace, and was in the media nationwide -- including a televised interview with NBC and articles featured in the Chicago Tribune and Wall Street Journal.